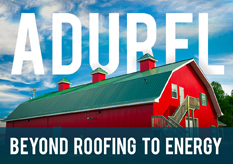 Adurel is an acronym for “ Advanced Urethane Elastomers” and stands for our commitment to advance and integrate the latest polymer technologies available into the roofing and waterproofing industry. All systems are designed with primary focus on sustainability and energy conservation. Much of the history of performance, references and photographs for Adurel date back to applications with initial formulations that were manufactured since 1981. That history, along with the experience of the owners bring Adurel the best technical and field experience in the coating industry and the long term performance to prove it. We understand that no product stands alone without proper application and have over 150 years of combined applicator experience in our staff and reps. Our certified contractors are well trained and warranted applications are thoroughly inspected to insure that the customer gets what he pays for- an advanced roofing system that is sustainable for the life of the building. Adurel of today is advancing into renewable energy by integrating state of the art renewable energy technologies into and on our roofing and waterproofing systems. The combined systems are warranted watertight and stable against the elements and are suitable for rainwater catchment to conserve and protect the water or reduce sewage. To the Customer: Manufacture and stand behind the highest performing renewable roof system available. To the Contractor: Back the contractor with the best training and supervision to insure a profitable and problem free application. To Ourselves: Continue the unending goal of creating the perfect roof while maintaining the highest business ethics. To the Environment: Adapt and integrate roofing and renewable energy to work together for reduced combined costs and greater utilization. Thank you for considering Adurel for you project.